This is a sponsored post written by me on behalf of Tyson Foods, Inc. All opinions are entirely my own. This shop has been compensated by Collective Bias, Inc. and its advertiser. #ReimagineYourRoutine #CollectiveBias. 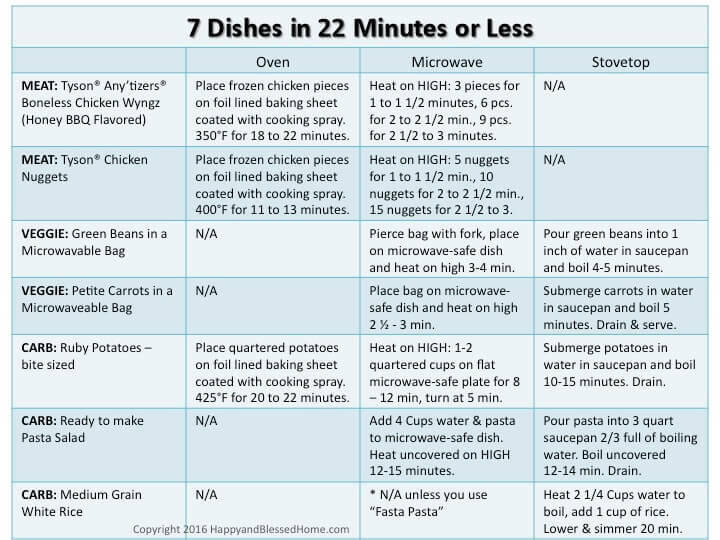 Now you can download and print my easy checklist for 7 Dishes in 22 Minutes or Less. Use this list and you’ll never be caught off-guard to cook a quick and tasty weeknight dinner ever again! Back to School is around the corner, and believe me when I say — I know there are evenings when things get a little crazy and it’s already due when you stop to think about dinner. Well, getting caught off-guard when it comes to meal-planning has certainly happened to me – especially as we head into the fall and back-to-school season. So I created a cheat sheet for quick and easy meals that are ready in 22 minutes or less. Yep, 7 Dishes in 22 Minutes or less is a one page guide you can print out and keep on hand to get you through the sometimes “crazy” season of back-to-school. The cheat sheet includes meat entrées, vegetable sides, and some carb options that are quick and easy. If you find yourself in a super rush on many nights, make sure you scroll down for my cook-ahead, freeze and reheat ideas below. 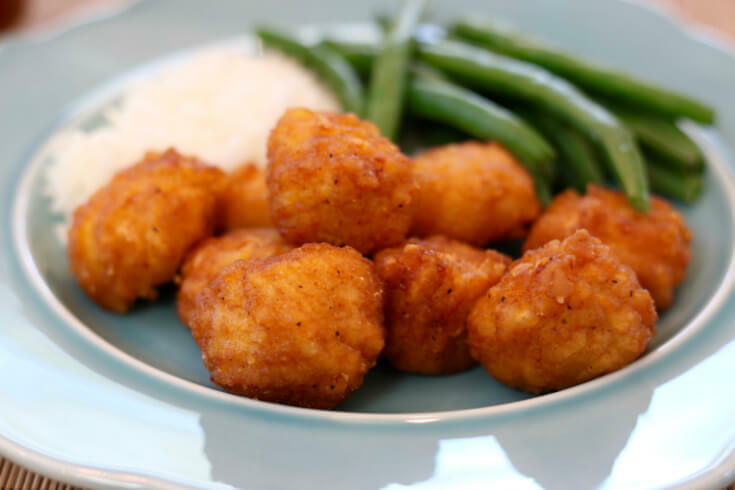 The “core” item in my secret sauce for 7 Dishes in 22 Minutes or less is Tyson® Chicken. 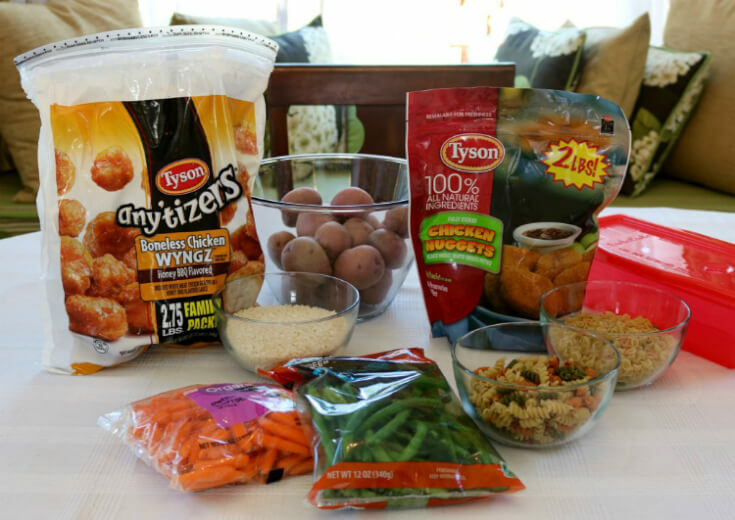 I picked two of our family’s favorites for this helpful “cheat sheet”, but Tyson® offers a wide array of choices for families who love chicken dishes. 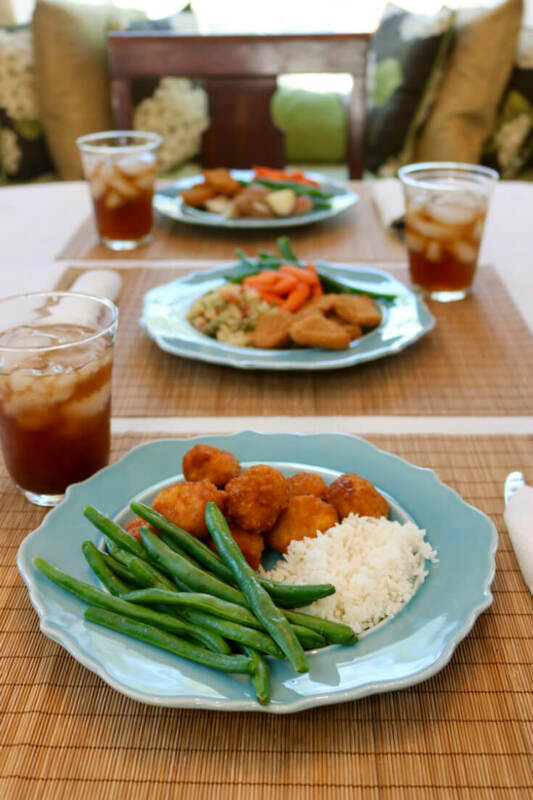 Our family is always on the go with gymnastics, social activities, and more, so Tyson® frozen entrées and some tasty sides are the perfect solution for weeknight meals. Plus, since Tyson® Chicken comes frozen, it’s always ready on-hand for when you need a tasty dinner on nearly a moment’s notice. As you’ll see on my “cheat sheet” below, many of the items I’ve included can be microwaved. 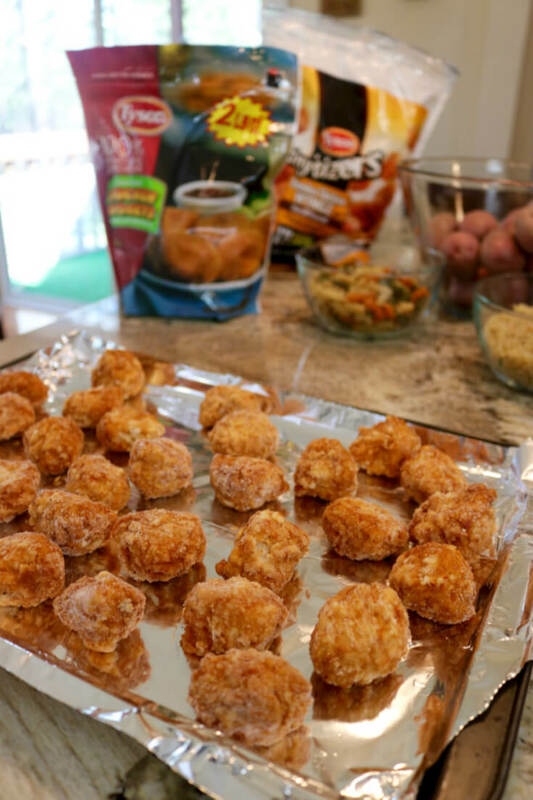 But in the same amount of time it takes to get my kids cleaned up and to the supper table, I can heat up Tyson® Chicken Nuggets or Tyson® Any’tizers® Snacks in the oven. Everything comes out crisp and juicy – just like homemade – for our family. The entrées are easy to prepare – just cover a baking pan with foil, spray with nonstick cooking spray and heat according to directions. Every dish is packed with flavor, and it’s so nice to have an easy entrée that serves up perfectly every time. I wanted to create something super simple for quick weeknight dinners, so here is my one page “cheat sheet”. If you keep these items on-hand or in your freezer, you’ll always be ready for a quick evening meal. Now, my cheat sheet focuses on cooking options as provided via the packaging for each of these items. But I also found a simple solution for cooking with a microwave that results in perfectly cooked pasta, potatoes and rice. It’s called a “Fasta Pasta” and it cooks the rice, potato and pasta options in a way that results in even-distribution and “al dente” results. I’ll include links to fabulous fast-cooking kitchen tools at the end of this post. 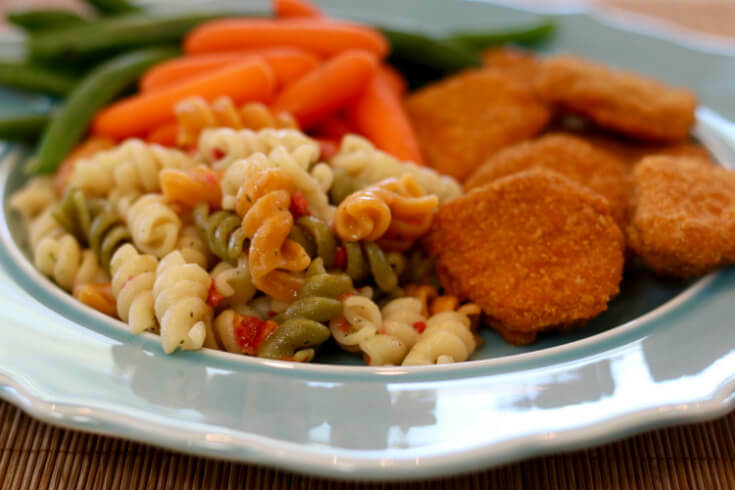 Tyson® Chicken Nuggets with spiral pasta, carrots and green beans. If you coordinate your cooking – you can have the meat in the oven, the pasta on the stovetop, and heat the veggies in the microwave; and have everything ready in 20 minutes. 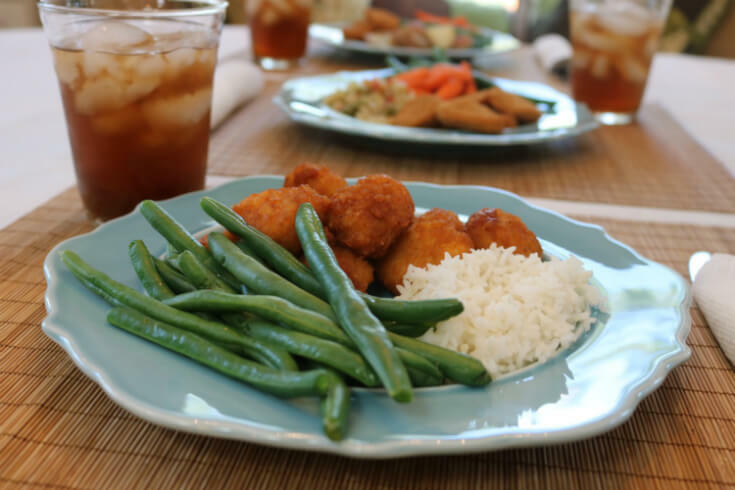 Tyson® Any’tizers® Boneless Chicken Wyngz (Honey BBQ Flavored) with green beans and white rice. Coordinate your meal and cook the meat in the oven, rice on the stovetop, and veggies in the microwave for dinner in less than half an hour. 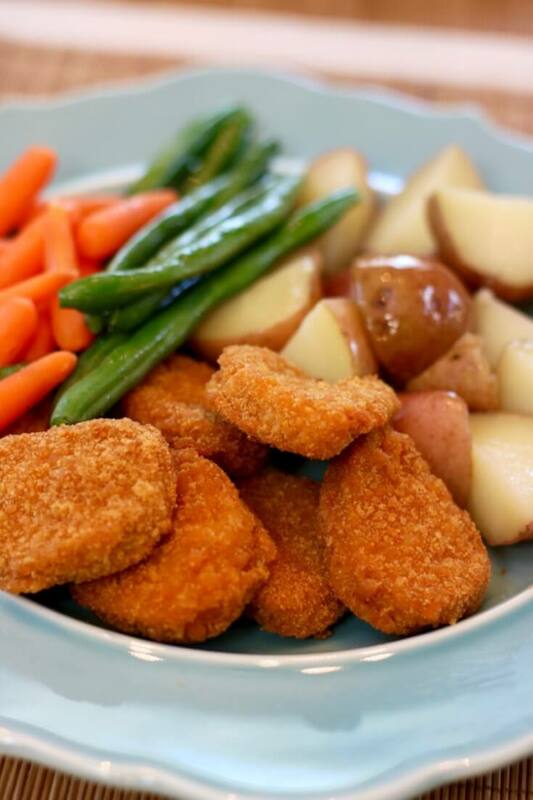 Tyson® Chicken Nuggets with ruby potatoes, carrots and green beans. For this meal you can cook the meat in the oven, the potatoes on the stovetop and the veggies in the microwave for dinner in less than half an hour. Now, if you know you’ll have evenings when things are so busy you’ll have only a few minutes to heat and eat, you’ll want to use the microwave for most of your cooking. You can plan ahead and cook the pasta, rice, and potatoes ahead of time and freeze them for a reheat and eat scenario. I’ve already included the instructions for microwave cooking the Tyson® Chicken entrées in the printable above. I cooked everything you see featured in this post, and I froze 1 1/2 cups of the potatoes, rice, and pasta in small freezer zip-top bags. The next day I microwaved them to see the best method for reheating. Microwave ovens vary – so, cooking time is approximate. If desired softness is not achieved, cook in additional increments of 20-30 seconds until desired softness is reached. You can serve any of these dishes plain or add your desired seasoning or toppings. Spiral Pasta: Place 1 1/2 cups of frozen spiral pasta in a small glass bowl and add 1 tablespoon of water. Re-heat in the microwave uncovered for 2 1/2 minutes on high stopping half-way to break apart and stir the pasta. Cover to keep it warm until ready to serve. 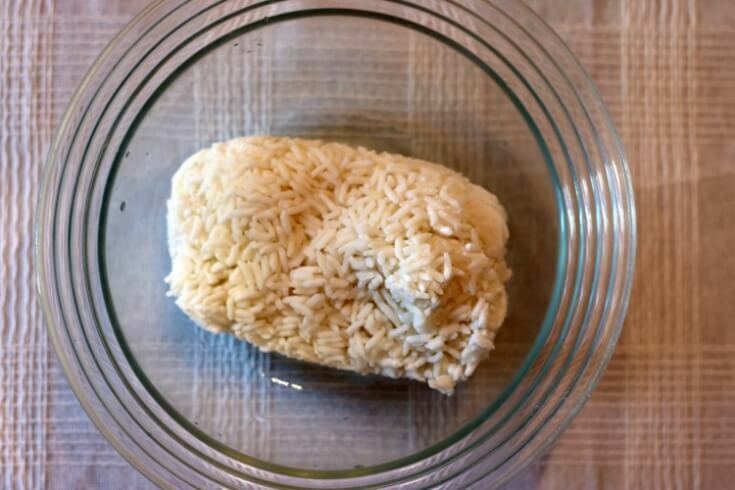 Rice: Place 1 1/2 cups of frozen rice in a small glass bowl and add 1-2 tablespoons of water. Re-heat in the microwave uncovered for 2 minutes, toss with fork and cover to allow steam to soften. You can serve the rice one minute later. 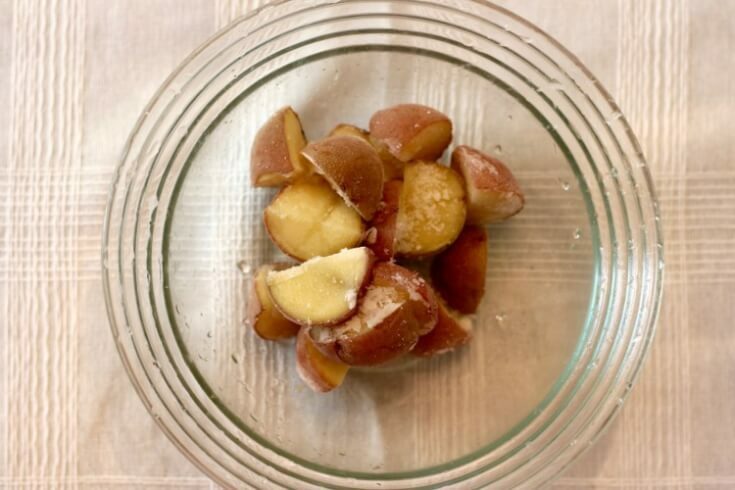 Potatoes: Place 1 1/2 cups of frozen potatoes in a small glass bowl and add 1-2 tablespoons of water. Re-heat in the microwave uncovered for 3 and a half minutes. Cover to allow steam to keep warm. Serve. You can also freeze the vegetables – uncooked, so you can have them ready whenever you need them. Green Beans: Place 1 1/2 cups of frozen green beans into a covered, glass casserole or other suitable microwave cooking dish with a lid. Add 2 tablespoons of water and microwave, covered, on high for 3-4 minutes. Heat additionally in 30 second increments for a softer texture. Carrots: Place 1 cup of frozen carrots into a covered, glass casserole or other suitable microwave cooking dish with a lid. Add 1 cup of water and microwave, covered, on high for 5 minutes. Heat additionally in 30 second increments for a softer texture. Drain and serve. Voila’, now we have a handful of options for those crazy-busy days. You can stock up and keep the Tyson® Chicken entrées in the freezer, the veggies in the fridge, and the carbs in the pantry. Or, you can cook everything ahead of time, and have everything in the freezer ready to go for when you need to reheat and eat. I found everything I used in these easy dishes at Walmart. 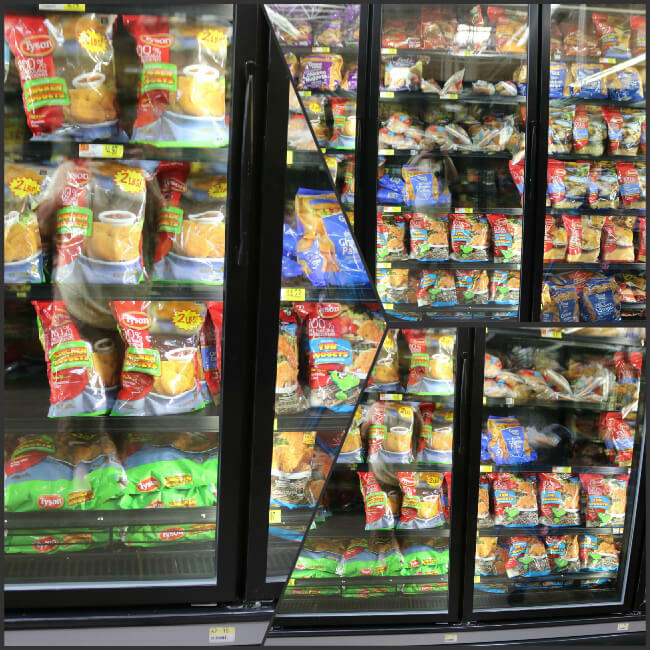 You can find the Tyson® Chicken Nuggets in the frozen meals section in the Walmart freezer case. What are your Sanity Savers for Back to School? Do you have any special tips to share for time-savers in the kitchen? How do you plan ahead for the back-to-school season? Please leave your recipe idea or shortcut below. I always love to hear from this online community, and I’m sure other HappyandBlessedHome.com readers will love your tips. Do you have a board for Back to School or Lifestyle Hacks on Pinterest? Help spread the word and PIN this post on Pinterest!